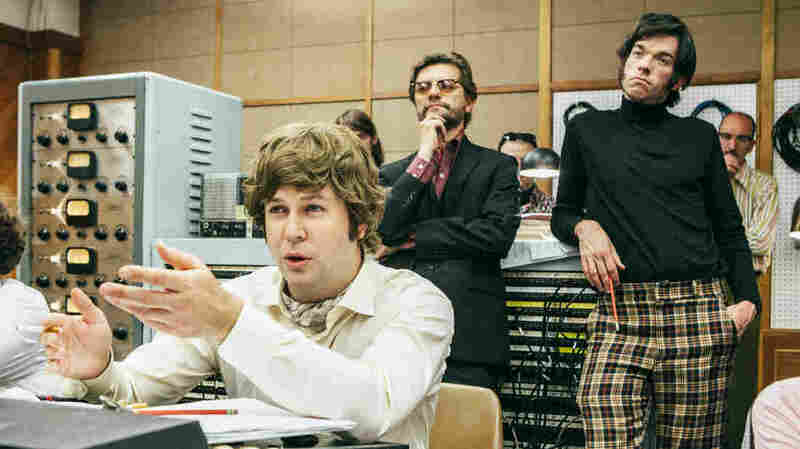 Review: 'Documentary Now!' Makes John Mulaney Into Stephen Sondheim For 'Co-op' The IFC series Documentary Now!, which has been in fine parody form for three seasons, plays around with Stephen Sondheim's Company and Broadway conventions in a new episode. Taran Killam as Benedict A. Juniper, James Urbaniak as Howard Pine and John Mulaney as Simon Sawyer. If we still lived in a world in which everything had to justify time on one of only three broadcast networks, the odds that we would ever have seen the birth of an entire series that parodies documentaries is zero. It is less than zero. (And if there were a documentary about the making of the movie Less Than Zero, there would be a Documentary Now! episode about it.) It is for lovers of parody who are also lovers of documentary who are also lovers of whatever the particular parodied documentary is about, be it bowling or Broadway or '70s bands. Documentary Now! airs on IFC and was created by Saturday Night Live veterans Seth Meyers, Fred Armisen, Bill Hader and Rhys Thomas. In its first season, it covered some famous films like Grey Gardens, Nanook Of The North and The Thin Blue Line. But the longer it runs, the more specific and strange it can (blessedly) become, and on Wednesday night, it uncorks one of its best episodes yet. Wednesday's episode is called Original Cast Album: Co-op. Its jumping-off point is Original Cast Album: Company, a 1970 D.A. Pennebaker film about the recording of the cast album of Stephen Sondheim's Company. Pennebaker's film is marked by several memorable sequences: Elaine Stritch doing take after take in the wee hours of the morning of the marathon recording session, trying to nail "Ladies Who Lunch"; Sondheim politely and brutally criticizing tiny details of the performances of cast members; and Beth Howland's bravura performance of the rapid-fire patter song "(Not) Getting Married Today." Co-op does specifically tweak some of these sequences. John Mulaney (one of the show's consulting producers) plays the pompous composer Simon Sawyer, a black-turtlenecked windbag whose incoherent advice no one wants to contradict. Paula Pell plays Patty, whose long struggle with a late-night recording is not precisely Stritch's — who would try to be Elaine Stritch, after all? — but whose exasperation plays with the same marvelous "it's three in the morning and I very much hate my life" energy. One trick, of course, is that in order to make this, you also have to write the music of your fake musical. That's not a first for Documentary Now! which has written songs before (including for its faux-doc about a soft-rock band called Blue Jean Committee). But it's an impossible task if you attempt true duplication: You cannot write Stephen Sondheim music. Nobody else can except Stephen Sondheim, and that's what makes him Stephen Sondheim. What Mulaney and Meyers, who wrote the music with Eli Bolin, did instead was to call to specific qualities of Sondheim's writing. For instance, there is a moment in the closing number when people begin just ... saying things during songs. They say these things with great passion, just the way people near the end of Company keep saying things like "Add 'em up, Bobby, add 'em up." It's a very Sondheim quirk and a very Broadway quirk, and it takes a sharp ear to deploy it in parody in just the right way. There's also fine attention to detail, period and otherwise: the haircuts, the clothes, it's all very '70s. And the intense way that theatrical performers look when they're cutting a record — enunciating perfectly while staring wide-eyed, conducting with one hand, or putting a finger to an ear — is familiar to anyone who's ever seen a recording session documented. But none of it would work without casting, which is where Documentary Now! 's apparently deep connections to a freakish number of funny and talented people once again becomes essential. On a recent appearance on Late Night With Seth Meyers, Mulaney revealed that one of his first notes for a take on Company, before he'd really written anything — when it was all still an idea — was, "Richard Kind is in this." And Richard Kind, as it turns out, is in this. Kind is not only very, very funny, but he's done real Sondheim before, in the show Bounce. Here, Kind plays a very out-of-breath singer who's playing a doorman, and if you want to spoil a smidge of the episode for yourself, you can see him perform the song for the Late Night audience. They've also goosed the episode with familiar Broadway stars: Renee Elise Goldsberry (the first Angelica Schuyler in Hamilton on Broadway) shows up as an overqualified singer who still finds herself nitpicked by Mulaney's weird genius, and Alex Brightman (the first Dewey Finn in School of Rock on Broadway), performs the requisite patter song. That's on top of reliable talents like Mulaney himself, James Urbaniak, Taran Killam, and that delightful and strange turn from Pell. One of the biggest mistakes in parody is to do it without knowing your stuff. You can't parody romantic comedies, for instance, based on what you've heard about them third-hand; you have to know them in and out. That's where the details come from, and it's recognizing details that makes parody land. And really, that means you have to have some affection for them, or why would you know them well? That's why This Is Spinal Tap is a classic: It's so close, because the people who made it know so much about that kind of band. It seems counterintuitive that parody is an act of love, but it's true. And this episode, written by Meyers and Mulaney, fairly oozes with love of Broadway, love of Sondheim, and love of '70s weirdos with big sideburns. All to its benefit, to say the least.